Cloud storage is an online service which enables you to store, back-up and remotely access your data – from anywhere. All you need is an internet connection. It’s flexibility and cost-effectiveness mean that the online storage market is growing fast. 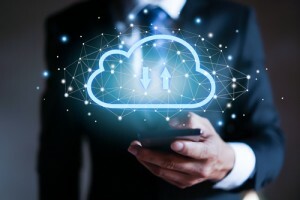 In fact, the cloud storage market is projected to achieve a compound annual growth rate of 29.73% during the next five years (Business Wire). The number of organisations gaining competitive advantage through high cloud adoption has almost doubled in the last few years (Big Data Made Simple). With this trend set to continue, what are the benefits of using cloud storage? Being able to access data online from any location gives your business complete mobility. Whether agenda items, travel plans or meeting times change, cloud storage enables you and your colleagues to adapt and carry on working efficiently. Cloud storage works on any device, from any location. Whether you are Mac users or PC-based, a single user or have several employees… online storage will work for you. Team members can easily share data and collaborate to complete projects even from different locations. Field workers can easily share real-time data and updates with those in the office. In addition, cloud computing eliminates redundant or repetitive tasks such as data re-entry. Cloud storage can be used as a back‐up plan by businesses as it holds a copy of important files. This data can be then accessed through an internet connection. Storing data internally is more expensive regarding equipment and power. Online storage removes the need for investment in storage hardware. If you would like to find out how Cloud Services could work for your business – or if you want a solution that works harder for your business, contact EMH Technology. Email, file storage and backup, antivirus, web filtering, telephones and databases can all be provided regardless of your location. Let’s talk.